with singing lips my mouth will praise you (NIV). A healthy human body can go as much as ninety days without food, but only about ten days without water. Water is life. Without it we perish. A few years ago with great fanfare, it was announced that liquid water had been discovered on the surface of Mars. This opens the possibility of microbial life on or just beneath the Martian surface. What is more important, human life can be sustained on Mars for long periods if water is present. The introductory note to Psalm 63 informs us that David composed this psalm, when he was in the Desert of Judah. But there is something quite startling about this psalm. David is not crying out for water as we might expect. Instead, David is crying out for God. He’s not seeking for water; he is earnestly seeking for God. When was the last time you thirsted for God like a man trekking in the heat of the desert? I must confess I’m better at ignoring God than seeking Him. But that was not David’s mindset. David recognized his need for God. He was thirsty for Him. Our thirst for God should be a constant in our lives. As I write this, I pause for sips of my morning coffee. It’s a thirst I have—a longing that prompts me to pick up my cup. At various times throughout the day do I thirst for God in the same way? Do I long for His Spirit and the thrill of His presence near me? Are you spending your days in a spiritual desert? Are you yearning for intimacy with God? Oh that we might thirst for God as David did! Response: LORD God, I want more of you in my life. Help me to sing and praise your name, and draw my satisfaction from you. You are the true source of life and joy. All my springs of joy are in you. Amen. Your Turn: How can we cultivate a personal thirst for God? How long will you assault me? pour out your hearts to him, for God is our refuge (NIV). We find rest in the redemptive suffering and death of Jesus. Jesus concluded his Sermon on the Mount by telling the parable of the wise and foolish builders (Matthew 7:24-29). One man built his house on sand, while the other built his home on the rock. Only the house built on the rock was able to withstand the floods and storms of life. Having Jesus and his teaching at the very foundation of your life will help you withstand all the hardship and temptation the world and the devil can throw at you. Did Jesus use Psalm 62 as his story prompter as he told the parable of the wise and foolish builders? Until we pass over to eternity and can question Jesus personally, we cannot know the answer with absolute certainty; nevertheless, there is a striking parallel between Jesus’ built-on-a-rock parable and Psalm 62. According to this psalm, David found his rest in God. God was his rock. His life rested secure on that eternal foundation. Here is David’s confession: Yes, my soul, find rest in God; my hope comes from him. Truly he is my rock and my salvation; he is my fortress, I will not be shaken. To David’s declaration of allegiance to the Rock, Jesus adds this thought. Our connection to the Rock is established as we put his words—Jesus’ words—into practice. What is your life resting on? Response: LORD God, you are my mighty rock, my refuge. In a troubled world you are a sure foundation. My soul finds rest in you. Help me put into practice the words of life—the words of Jesus. Amen. Your Turn: In a changing world has the LORD become your rock of stability? Are you heeding this admonition from James, the brother of our Lord? Do not merely listen to the word, and so deceive yourselves. Do what it says (James 1:22). This Good Friday may you find your rest in the redemptive work of Christ on the cross. This evening is a final rehearsal for “The Centurion’s Report” at South Delta Baptist Church. I am here on the west coast, 2,000 miles from home to bring the story of Christ’s passion to life, as seen through the eyes a Roman centurion. In addition to the Easter morning presentation sited in the news article above, I’ll be doing the same drama at the Kingsway Foursquare Church at 6:00pm on Good Friday. Have you been to the foot of the cross recently? Discover the drama; enjoy the book. and fulfill my vows day after day (NIV). As is so often the case, this psalm begins with David crying out to God. It would seem David is not at home. He is calling out from the ends of the earth. From biblical history we know that David was not a world traveller. 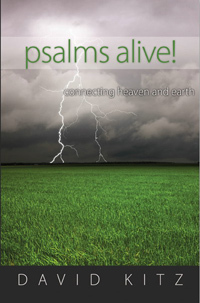 He never ventured beyond the traditional territory of Israel, so in this psalm where exactly are the ends of the earth? If I have offended my wife and the issue has not been resolved, we can be sleeping in the same bed, but there is a distance between us. Though she is physically present there is a gulf between us. Spiritually and emotionally we are on opposite sides of the planet. For that night I’m on the other end of the earth. The same can be true of our relationship with God. God, the LORD, the Creator of the ends of the earth is always close at hand. He is present and evident in His creation. But beyond that He has promised to dwell within every believer. We have Jesus’ promise on this. “The Spirit will show you what is true. The people of this world cannot accept the Spirit, because they don’t see or know him. But you know the Spirit, who is with you and will keep on living in you” (John 14:17 CEV). That means we can call out to God with confidence. He is more than nearby; He is within us helping to form the words of our prayers. We can draw close. David reminds us that we can take refuge in the shelter of your wings. Response: LORD God, help me to draw near to you. Thank you for the indwelling Holy Spirit. You have been my refuge, a strong tower against the foe. Amen. Your Turn: What creates distance between you and God? What draws you close? There are many who assert that prayer is the answer. That’s nonsense! Prayer is not the answer. God is the answer. What we need is God. We need to hear the Holy Spirit speaking into our spirits when we pray. Prayer is simply a means to connect with God. Prayer is part of the divine equation. But it’s God whom we seek. He is the solution—the eternal amen—the reward at the end of the quest. Response: LORD God, teach me to pray like David prayed. Give me ears to hear your voice when I come before you. Direct my thoughts into the path you have chosen for me. Amen. Your Turn: Has God spoken to you at various times?